Episode 6 of of Plugged In radio is with Victoria Ryle-founder of Kids’ Own Publishing Partnership, Ireland (1997) and Kids’ Own Publishing, Australia, 2003, has pioneered publishing books by children through artist-led community partnerships, presenting on this practice worldwide. 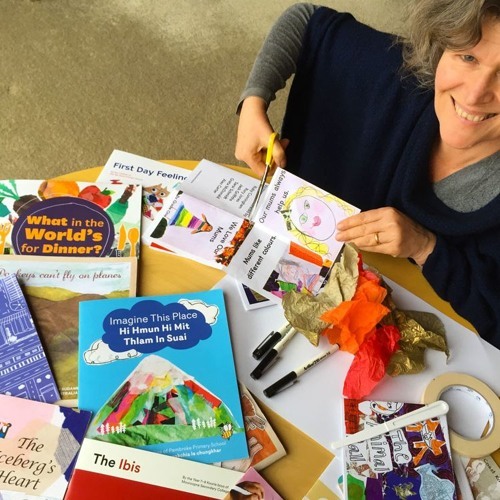 She is currently undertaking a PhD at UTAS on the culturally transformative power of publishing with children drawing on 30 years experience as a teacher, facilitator, advisory teacher and teaching artist. Victoria is now co-director of all that we are, a space for residencies and gatherings that connect communities through creativity in Tasmania. Victoria is a creative, a bridge and an enabler who can skillfully unlock capacity within community.